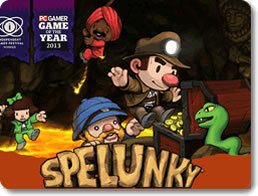 Spelunky Classic Game - Download and Play Free Version! Descend as Far as You Can Without Dying in these Treacherous Caverns. A riveting challenge awaits you deep underground. Long labyrinths of caverns stretch as far down as the center of the planet. Anyone courageous or foolish enough to brave this dark place will find many treasures. If you can get out with just a fraction of them in tow, you'll be rich beyond the dreams of avarice! The key word is "if," for these caverns are also filled with all manner of dangers. There are pitfalls, traps, venomous snakes, aggressive bats, bloodthirsty vampires, primitive ape men, and other horrible things that will promptly release you from this mortal coil if you're not careful. Do you have what it takes to spelunk in these caves, use your wits and a variety of tools to survive, and get out with all the treasure in the world? With Spelunky, the only way to answer that question is to descend. The object of Spelunky is simple. All you need to do is descend as far down the cavern as you possibly can. Pack a few sandwiches; this is going to be a long trip. There are a lot of things to keep in mind for your journey, as well as a lot of actions you'll need to pull off. Every level is generated randomly. Cavern layouts, enemies, treasures and items are all created on the fly. No two games will ever be the same. Play with the keyboard or attach a gamepad for a more console-like experience. Take out enemies with your trusty whip. Pick up anything that isn't nailed to the ground. Throw them with great force to kill hostile foes without using any precious supplies. Grab an assortment of treasures, including gold, gems, artifacts and crystal skulls. Use them to purchase items from shopkeepers that will help you on your quest. Rescue damsels in distress to increase your health, or sacrifice them at an altar! You're going to need more than just your whip and dashing hat if you want to live to tell the tales of your adventures in Spelunky. Luckily, observant spelunkers will find a variety of interesting items littered all over the cavern. There are a lot of ways they can assist you, provided you're creative enough to imagine them. Cast ropes off of ledges to safely climb from one area to the next. Set off bombs to kill multiple enemies at once, or to destroy walls and give you more places to progress through. Use the parachute to safely drop down long chasms or hazard-ridden pits. Improve the height of your jump with a pair of Spring Shoes. Dig your own tunnels with the mattlock. Blow enemies away from a distance with a bow, pistol or shotgun. Come back from the dead with the rare and powerful Ankh. 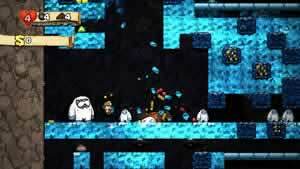 Dying is as inevitable in Spelunky as it is anywhere else. It's not a matter of "if," but "when." Don't let that deter you; death is all a part of the learning experience. Just about everything in the cave can kill you, so proceed with only the utmost caution. Death is permanent. When you die, your game is finished and you'll have to start all over again. Be careful! Kill or avoid dozens of different enemies, including snakes, bats, spiders, poisonous frogs, cavemen, skeletons, sasquatches and more. Be wary of traps. Avoid setting off arrow traps, look out for boulders, and so on. Don't fall too far. It can hurt. Take care not to anger the shopkeepers. They're well-armed and unforgiving of thieves. Move fast. If you don't find the exit quickly, then the Ghost will come and get you! Check out your high scores every time a game ends or begins. 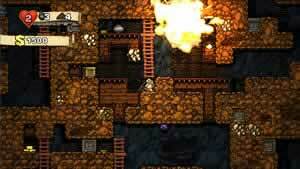 If you're looking for a unique challenge, then Spelunky is an excellent game to add to your library. With amazing platforming action and randomly-generated environments, the replay value is through the roof. Every game you start is going to be a completely new experience. No matter how often you die, chances are high that you'll come back for more just to see if you can do even better next time. There's a whole lot of value to be found in Spelunky that's worth more than all the gold stashed away in its cavernous halls. Despite that, it's 100 percent free! If you want to experience a game that harkens back to the olden days where skill was rewarded, then dive into the dark world of Spelunky right this instant.